Melissa’s is also one of my favourite stories, although not simple at all. Her journey was convoluted and strenuous, but what I most admire about Melissa is how she took it in stride. Many women face infertility with depression, anxiety and a sense of doom, like I did. Melissa never did. In her own words, “I say I am an exception to the rule. Most women start to deal with infertility when they start trying. I was told at 18 it would be tough so I had such a long time to process and I knew I would be a mother, but I wasn’t going to stress on the how, because I knew it would happen. We filled out the adoption paperwork before starting IVF treatments and decided on only 3 rounds…so we could roll right into the next option of being parents. It wasn’t easy, to hear the treatments didn’t work, but I wasn’t devastated…It was like…okay what is next on the checklist. Also having Luka (our adopted son) took so much stress off and I welcomed alternative treatments to get my system working. I think we actually started acupuncture and diet (with Nadia) to get regular, not with the intention of getting pregnant”. Today, Melissa, JJ and their 3 boys live in Maryland in the United States. I met Melissa in 2008 in Mozambique. She came to me, as she said to help lose weight and do some acupuncture, in the hopes that she would finally get a regular period. At this point Melissa had already had 3 unsuccessful rounds of IVF, and conceiving a child was no longer in her radar. She already had a child, Luka, and she radiated happiness. 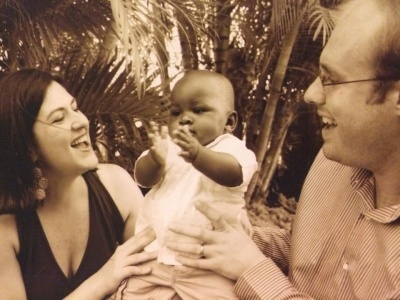 Melissa, is a Cuban-American at the time living in Mozambique with her Dutch husband, JJ. JJ was a diplomat and they were stationed in Maputo, Mozambique, where I was. She heard of me from a friend. I was the only person at the time in Mozambique doing diets, so it wasn’t hard to find me. Melissa came into my office with her baby boy, Luka, whom she had adopted at 8 months old. Melissa told me that she had never had a regular period in her life. In fact, she never had a period more than once a year and the first time she had a period she was 18 years old. She was diagnosed with PCOS. Like me she had some acne and male pattern hair growth. Unlike me, she had always been overweight. Her fertility journey began in 2006. Between 2006-2007 Melissa did 3 rounds of IVF. None of the rounds led to implantation. Her follicles never grew. They did attempt to fertilize one, but it was not viable. During the last IVF treatment, the doctor prescribed a round of 21 days of hormone shots. During a normal IVF round women give themselves a shot for 7-12 days in a row to stimulate egg production, Melissa did 21 days of self-inflicted shots in her belly, and even still her follicles never matured and they did not go on to the next step. At this point her doctor said to her, in her own words, “If you were my sister or daughter, I would advise that you give up IVF and consider adoption.” They had already done that. They signed the adoption papers before the first IVF round. Luka would and did go home with them. Melissa’s major concern was that she had heard from her doctor that not having a period was very unhealthy and dangerous. He mentioned cancer. Melissa’s dad and paternal aunt, both, had had breast cancer, as well as both her grandmothers. Interesting to note is that both her father and aunt are type 1 diabetics, who had been diagnosed with Diabetes and started insulin injections at 8 and 9 years old, respectively. After her IVF treatments, Melissa’s period still only came once that year. Because she had been subjected to all those IVF shots full of hormones, Melissa did not want to go on the pill to regulate her cycle. Melissa’s first pregnancy was very healthy. She never had blood sugar or blood pressure concerns. She lost some more weight after having Sam and she breastfed him for 2 years. After that her cycles were, and still are, very regular. She has a cycle every 32 days. After Sam was born, Melissa, JJ and their boys moved to La Paz, Bolivia. La Paz is a very high altitude city at 3,650 m (11,975 ft) above sea level, famously known as the highest capital city in the world. Melissa and I kept in touch. Something Melissa was not prepared for was the sickness that came with high altitude and what that did to her appetite. Because of the effect of the altitude on digestion, Melissa could never eat after 6 pm, or she couldn’t sleep. At this point Melissa’s diet had already changed a lot. She had cut out all grains, her largest meal was at 12 pm and in the evening she would have a very low carb meal. She also became very active, she would power walk, and was in the best shape of her life. In 2012, Melissa went to the United States to participate in a race with her sister. Her sister thought that she might be pregnant, and as a joke Melissa did a pregnancy test with her. Melissa was the one that was pregnant. 6 weeks along. This was the first time that she conceived spontaneously. Unfortunately, Melissa had a miscarriage at 12 weeks in Bolivia. It apparently is quite common for expats to have miscarriages in Bolivia, something to do with the altitude. She had a blood clot. Melissa was sad, of course, but this had been so unexpected, she didn’t even know how she felt. Right after that the family moved to Chile for JJ’s work. Melissa and JJ decided they were done having children and the spontaneous pregnancy came as an unexpected surprise. At this point they had Luka and Sam and they were happy. They booked a vasectomy for JJ. One week before JJ’s vasectomy, Melissa found out she was pregnant for the 3rd time! Another very healthy pregnancy. No gestational Diabetes, no other concerns. She continued to live a very healthy lifestyle. Mikha was born in Chile, in 2013. JJ and Melissa are now a family of five. Since being in the United States, Melissa struggles a bit more with her diet. She notices that when she is not as strict with her carbs, her period skips a month or two. She won’t have it be longer than that. As soon as her period is late (JJ did end up having a vasectomy after all) Melissa knows she has to go back to her usual strict low carb plan. I’m going through something very similar. I’m in my second round of IVF failed treatment. I’m trying intermitent fasting since january ’19, and low carb diet (not keto), also vegetarian. Any advice?